Bank Of America Ends Free Checking Option, A Bastion For Low-Income Customers : The Two-Way The bank is finishing a yearslong phaseout of eBanking, its last option for avoiding fees without keeping a monthly minimum. The move has drawn concerns it will hit low-income customers the hardest. 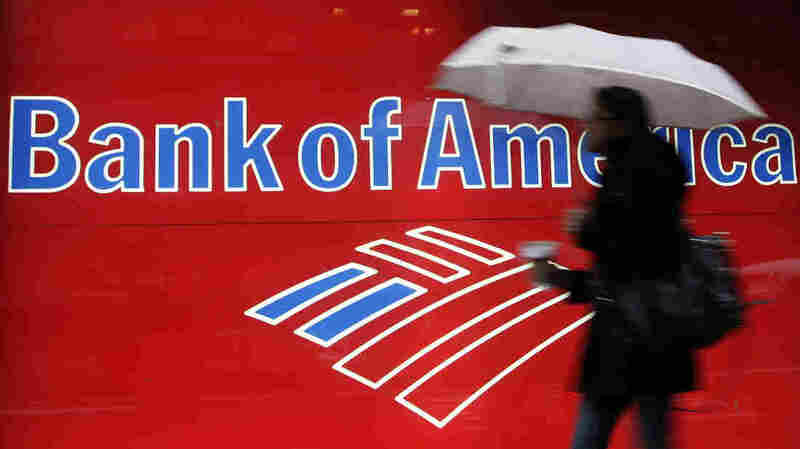 Bank of America is eliminating eBanking accounts this month, transferring their owners into accounts that charge a maintenance fee if they don't maintain a minimum balance or get direct deposit. The move ends a program introduced in 2010 and completes a phaseout begun several years ago, when the bank stopped offering eBanking as an option to new customers. The eBanking account had offered customers a checking account without any monthly fees, provided they conduct their business online or at ATMs. If the eBanking customers wanted to get their statements by mail and speak with tellers in person, the accounts would carry an $8.95 monthly fee. Now, the bank has swapped those remaining customers into Core Checking, an account that requires customers to maintain a minimum daily balance of $1,500 or at least one direct deposit a month of $250 or more — which comes out to $3,000 annually. Customers in these accounts are charged $12 a month if they cannot meet these requirements. "This is one of the lowest qualifiers in the industry and a great value," Bank of America spokeswoman Betty Riess told CNBC. She added that the Core Checking option "provides full access to all our financial centers, ATMs, mobile and online banking" and told the Chicago Tribune that — in the newspaper's words — "only a small number of customers still had eBanking accounts." That has done little to assuage critics' worries the move will disproportionately hurt the bank's low-income customers, who would be the likeliest to struggle to meet the Core Checking requirements. "The debate over Bank of America's accounts and fees points to a larger economic justice issue — people with less income pay more to get cash, make payments, and conduct their business," Dory Rand, president of the Woodstock Institute, told the Tribune. "Without access to safe and affordable bank accounts, low-income consumers often turn to costly alternative financial services, such as currency exchanges or check-cashers," she continued. "The bottom line is: the most financially vulnerable need more and better options to transact their business and participate in the financial mainstream." A study released last fall by Bankrate.com found that Americans with an annual household income under $30,000 pay more than three times the monthly bank fees paid by higher-income brackets — an average of $31 a month, compared with an average of $9 for other income groups. That is one reason why "just 59% of U.S. adults with household income under $30,000 per year even have a checking account," according to the study. The change has prompted a backlash online, including a snowdrift of tweeters professing their intention to close their accounts and criticizing the bank for its effects on low-income customers. A Change.org petition protesting the move has also drawn more than 86,000 signatures as of this writing. "Bank of America was one of the only brick-and-mortar bank that offered free checking accounts to their customers. Bank of America was known to care for both their high income and low income customers," the petition's creator, Mel San, wrote in her description. "Now sadly, Bank of America seems to have changed their mind and wants to no longer offer free checking accounts to the American public." The bank's chief financial officer, Paul Donofrio, spoke last week with Wall Street analysts, according to CNBC. During that conversation Donofrio said that, as the network puts it, "the U.S. banking industry has had little to no increases in deposit rates for traditional banking in recent years." And he explained what he sees as the bank's path going forward. "All I can tell you is that we're going to balance our customer needs," he said, "and we're going to balance the competitive marketplace with our shareholders' interests and we're going to do the right thing for all the parties."